It was a big day for the ducklings in the garden! 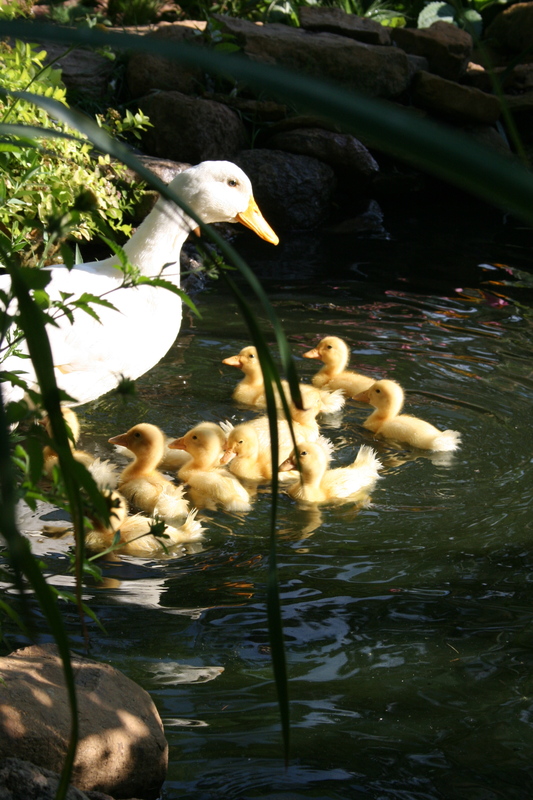 1 week ago Mama Duck hatched–11 ducklings. 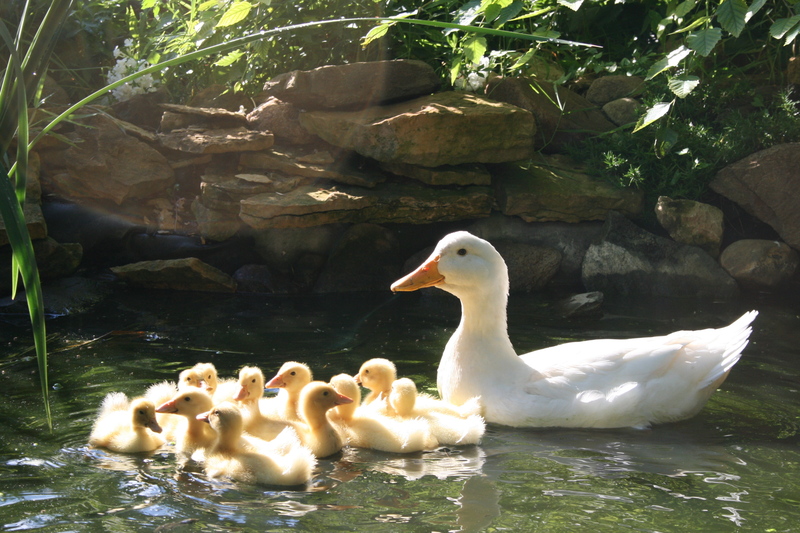 She has been an incredible Mama Duck, keeping her ducklings happy and hidden in the duck house. Papa Ducks have been guarding the exterior of the nursery. Mama Duck brought her family to the big outside world for the first time! 1st day of the real world! I swear she counts them! The ducklings and Mama swam, ate bugs, and snoozed on the pond edge. We all settled in and kept a careful eye on our latest additions to the garden. Kitties lurked about and Papa Ducks alerted the young ones. When the ducklings finally made their way back to the duck house, I breathed a sign of relief. Locked in and safe for the night! Can’t wait for day 2 of duckling school. How wonderful to be able to watch that. Enjoy day two as well. They are growing so quickly! So amazing to watch the parenting of these Ducks! We have ducks here as well, wild ones that is. My children and I always enjoyed watching mommy walk her babies across a road and watch out for them. We enjoy watching a mother bird teach her young how to fly and basically any other animal. We can learn a lot from the animals around us. Brings back a lot of memories. I use to use broody hens (chicken) to hatch guineas, ducks, and turkeys. It never mattered to then that their babies were a bit strange looking. One time one of the mother hens got a little to close to the pond with her ducklings and they jumped in. She was furious! I can image the drama of Mother Hen, when her baby went for a swim! I had hoped to hatch out chickens at least once here–but the Roosters, sadly, had to go! I loved having them, for the color and atmosphere, but when they turned on me!!! Off they went! I knew nothing about Ducks, when I brought home my Pekins a few years ago…..from what I read it’s unusual for Pekins to even be broody–as it has been breed out of them. But our little group is proving that the instincts are very strong! 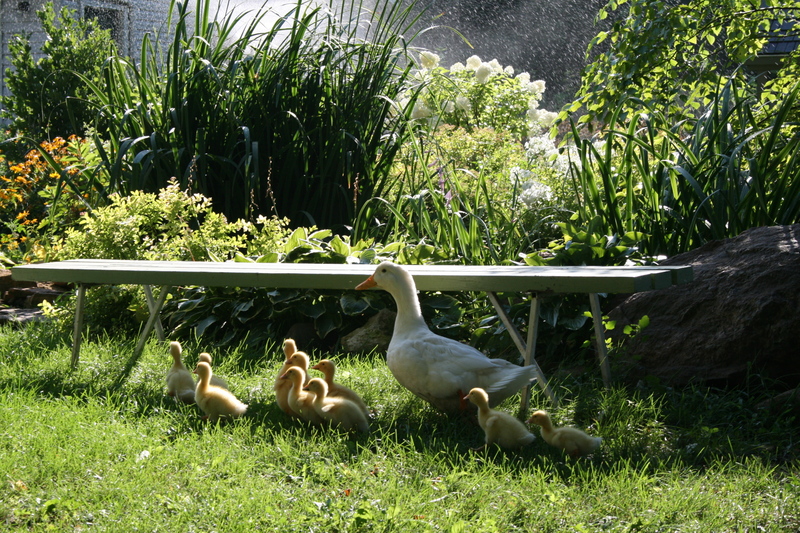 Quintessential country garden photo’s….Those ducklings and their momma are totally beautiful! When I see those little sweetie-pies, I want to talk the whole world into being vegetarian. Oh, how will I part with any of these?! And can I make people swear they will be loved pets?! No. 11 Duck is the smallest and my favorite! So sweet! There’s nothing as cute as ducklings! It’s been a treat to see them born here! My daughters that live away from home text me for updates and pictures! So cute!! The lighting on the baby ducks in picture 2 is exquisite. Fairy tale life you have out there! It was a magical moment! I turned off the dinner cooking in the kitchen, and we sat for 2 hours just watching them! Adorable. Somewhere along the line I missed that you had a pond. Would love to see more of that. So fluffy I want to die! The pond is small, sits between our fire pit and Rabbit Run Cottage. We enjoy the water sounds for sure! I have had Koi most Summers, but don’t do well keeping them alive in the Winter. The ducks eat my Water lilies and pond plants–naughty ducks! This year I declared it’s just the duck pond–I’m less stressed just admitting it! LOL. The duck pond. Perfect if that definition banishes stress. Brilliant photos of watchful mama and her sweet family. Lovely. Thank you, Amazing little family they are!